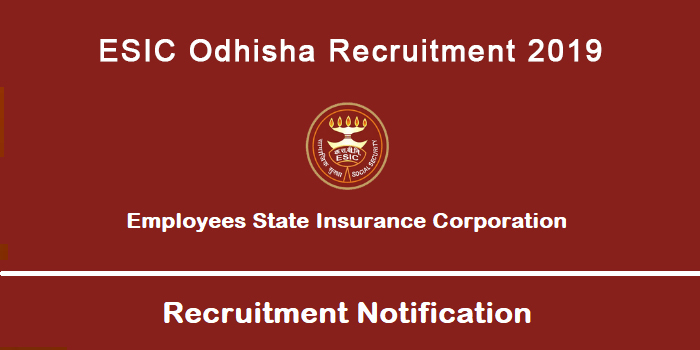 ESIC Odhisha (Employees State Insurance Corporation Recruitment 2019 Notification is finally out! It has finally released an official notification for a total of 31 posts for a Stenographer and Upper Division Clerk. The application link is now active. Candidates who have been eagerly waiting since a very long time can go to the official website and apply now! It is one of the most exclusive and awaited opportunities for all those hard working candidates, who strive to learn had and want to become future leaders. Those candidates who are eligible and looking for career growth and an excellent opportunity to nurture their soft skills can apply. Total Vacancies: Tentatively 31 in total. The candidates wishing to apply for ESIC Odhisha (Employees State Insurance Corporation Recruitment 2019) should have the 12th standard degree from a recognized university, board or institution. A. The candidates wishing to apply for ESIC Odhisha (Employees State Insurance Corporation Recruitment 2019) should have the 12th standard degree from a recognized university, board or institution. Step-3: A new page will open here; have to click on a link named “ESIC Odhisha (Employees State Insurance Corporation Recruitment 2019) ” (a download link). 5. If ESIC Odhisha (Employees State Insurance Corporation Recruitment 2019 receives a large pool of applications, then only those candidates who have been shortlisted on the basis of qualification, experience in the relevant fields shall be considered for the post. 7. The post is for Odisha Hence, only those candidates shall apply who are flexible in serving in Odisha.